Looking to be a part of an inclusive, music-obsessed gang? As a CKUA volunteer, you'll meet kindred spirits and help keep original radio thriving! Volunteering for CKUA feels good. It’s the reason our volunteers come back year after year. Not only is it a lot of fun — especially during our fundraisers and festival season — but you’ll be warmly welcomed into a group of passionate, thoughtful music aficionados. When you give CKUA your time and effort, you keep the music going. You play a direct role in keeping authentic radio on the air, inspiring listeners across Alberta and around the world. As a donor-supported station, our provincial team of volunteers is critical. Without you, CKUA wouldn’t be possible. The perks of volunteering with CKUA can be many: free live music, yummy food, awesome new friends, meeting CKUA hosts, honing a range of skills, learning about music, and most of all discovering a shared sense of purpose. CKUA volunteers are all so happy and proud to be a part of the movement. This vibe spreads across Alberta, leading you to new friendships everywhere. The joy in the air is one of a kind! The ways to help out at CKUA are as varied as the songs we play! (Well, almost.) Whether you’re spreading the word about CKUA at a music festival, helping us sort records in our legendary library, or chatting with donors during a fundraiser, you’re keeping CKUA strong. Share your enthusiasm and knowledge of CKUA! Lead tours of the CKUA headquarters at the historic Alberta Hotel in Edmonton for school groups or members of the general public. Be the sunny face of CKUA at a lively event! Engage and connect with CKUA fans and those who have never heard of us. Set up banners, sell merch and maybe even soak up some tunes. Help make our donors feel the gratitude! Assist with phone calls, letters and emails to let our donors know how appreciated they are. Help keep our library growing and thriving! Give our library technician a hand managing the inflow of new music and keeping the library organized. Get to know CKUA by helping out with admin work! Support one or more of our departments, including Volunteers, Marketing, Sponsorship & Sales, Programming, Library, Fund Development and Finance. Help raise dollars for intelligent, thoughtful radio! Every second year we need helpers for the CKUA Casino. Chat with other CKUA supporters and help us process their donations during a CKUA fundraiser! Keep your volunteer team well-fed and hydrated! Set out snacks, drinks and donated meals while keeping everything tidy. Pick up the delicious meals donated by generous donor restaurants and deliver them to CKUA to be devoured by you and your fellow volunteers. Take charge! Supervise six to eight volunteers on each shift and help the data managers ensure all data is accurately entered. Detail oriented? Team up with another Data Manager to keep the flow of information steady and accurate. 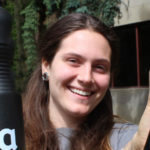 CKUA Volunteer Program Manager Breanne Coffill would love to hear from you.